Seeing all the pictures of fried chicken on ramen on social media, I told S that this was a must try. 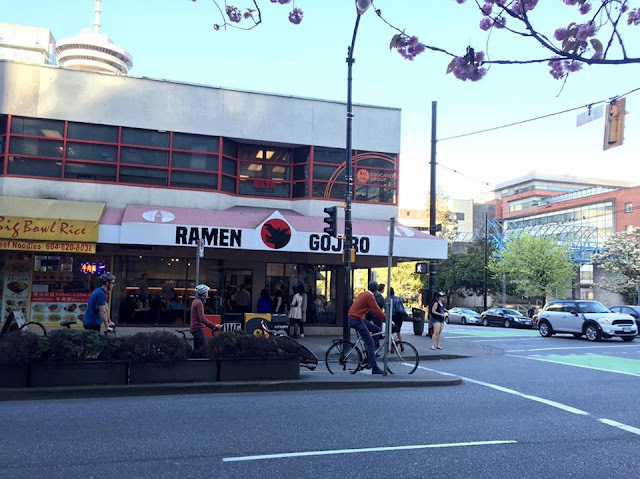 Ramen Gojiro is part of the Menya Kouji group which also owns Ramen Butcher and Taishoken. 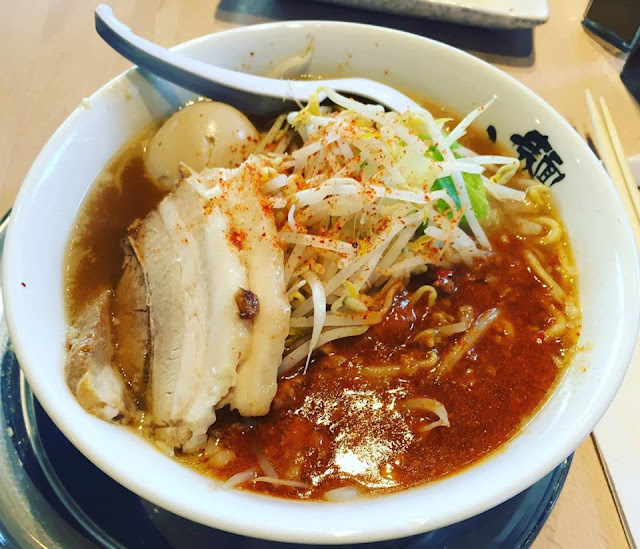 Their newest ramen shop is located in the core of downtown featuring jiro-style ramen which means thick noodles and lots of toppings. The interior is actually quite spacious and can fit quite a lot of diners. 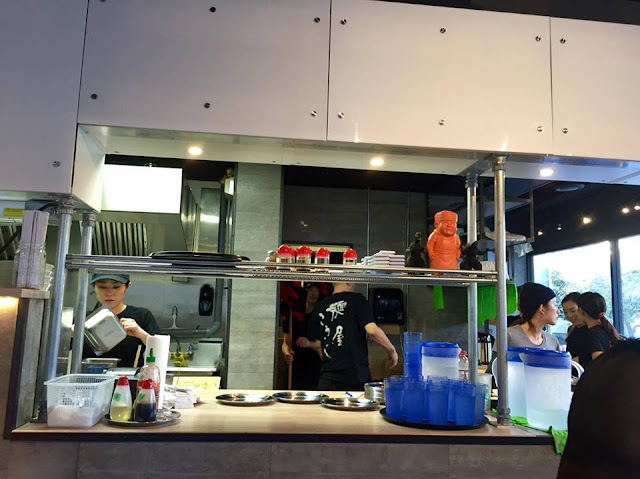 The kitchen is pretty much open so you can watch the action of the ramen chefs. Even though the space can fit around 20-30 people, there is always a line up! We arrived at around 5:30 and luckily were in the front of the line. By the time it was around 6pm, the line up was already very long. The menu is quite simple. 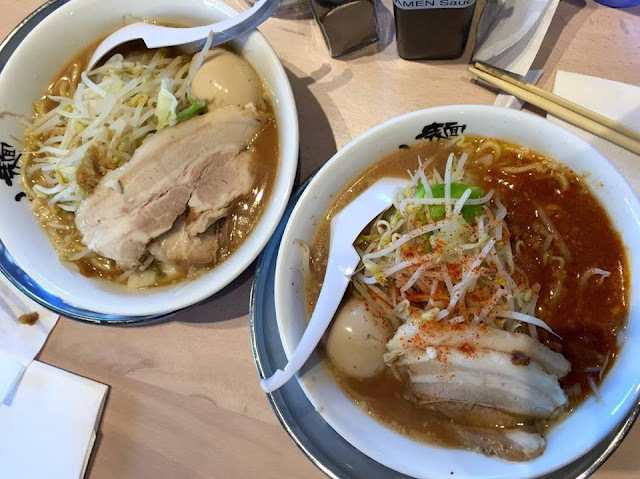 You can choose between fried chicken or chashu on your ramen. You can then choose to have their classic chicken and pork broth or the same broth with a spicy sauce. 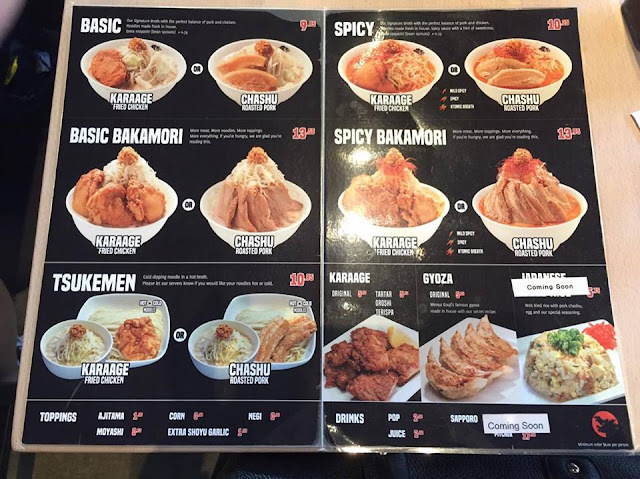 In addition, you can get the bakamori, which means you get more of everything. They also now offer tsukemen which are cold noodles in a separate hot broth you dip in. 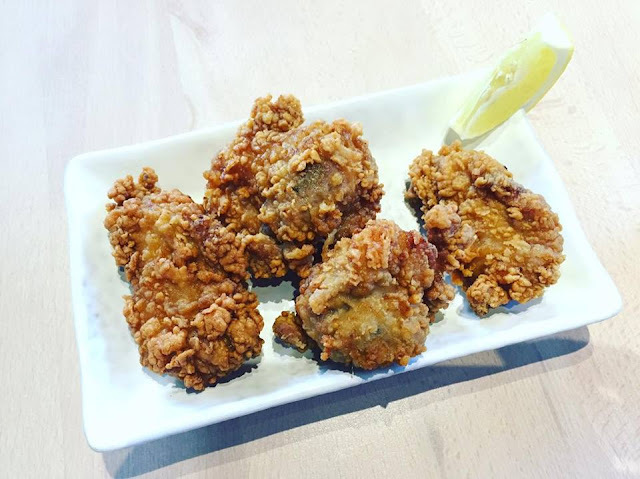 We were worried that having fried chicken on a hot broth would ruin the crispiness of the chicken, so we decided to order the Karaage on the side instead. You can choose to have this with a dipping sauce for $0.40 more, but we just got the original. These are big chunks of meat and are lightly battered so very crispy! They sure know how to make good fried chicken here. S got the Basic Chashu and added an ajitama (soft boiled marinated egg). They will ask you if you want a fatty or lean broth, of which S chose the former. They will also ask you if you want garlic on top, which S got. 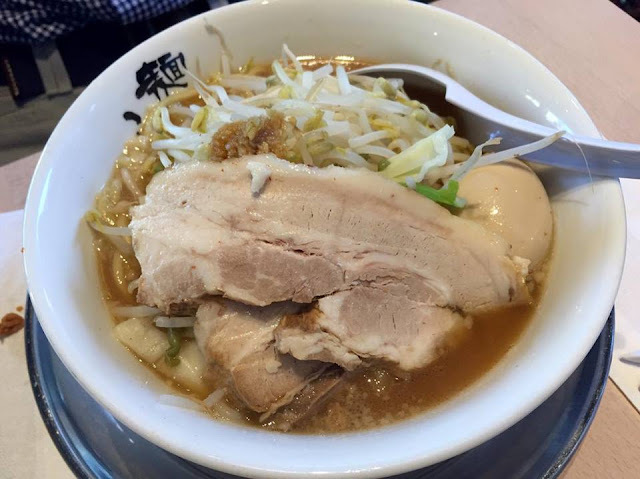 The ramen noodles are quite thick (the size of spaghetti) and come loaded with bean sprouts. We were disappointed with the broth as we found it lacked flavour and depth. The chashu was also a miss for us as I found the meat very dry and the fatty parts did not have the melt in your mouth texture. For myself, I got the Spicy Chashu of which I found the broth to be slightly more rich and flavourful. I asked for mild spicy so this was the perfect amount of spice for me personally. The egg was decent, although I still prefer Marutama’s. Overall, S and I were both not a fan of the thick noodles and all the bean sprouts but I know many enjoy this style of ramen. I don’t think we will be returning any time soon although we did enjoy their chicken karaage. Worth a try if you are interested in trying a new style of ramen or if you prefer thicker styles of ramen. Oh, and they offer you bibs to wear to avoid any splashing on your clothes!